Is anyone up to cooking burger steak from scratch? It’s time for a healthier alternative to the take out favorite. 1. In a large bowl, combine ground beef, onion, paprika, garlic powder, egg, salt, pepper and bread crumbs. Mix until well combined. 3. Gently press on the ball shaped meat mixture to form a flat beef burger patty. 4. 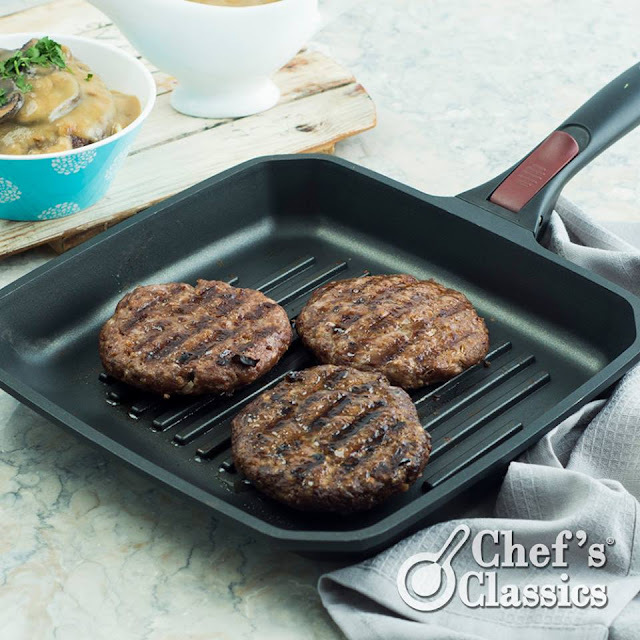 Heat the oil over medium heat in your Chef’s Classics Caper Grill Pan and cook the burger patty for 2 to 4 minutes per side. Transfer to a serving plate. 5. For the sauce, cook the flour in the pan over medium heat until light brown. 6. Add butter and stir vigorously until smooth. Set aside. 7. In the same pan, heat the oil and sauté garlic. 8. Cook the mushroom for 2 minutes. 9. Add the flour and butter mixture. 10. Gradually add the milk. Keep stirring constantly until free from lumps. 11. Add soy sauce and simmer for 15 minutes. 13. Pour the sauce on the burger patty. Now, it’s ready!